Camcorders are great as what they are- no debate on that. But what if we dome a few modifications and use a camcorder as a full-form webcam? I know you are also thinking on the same frequency and looking for a first-hand guide to do that. Well, brace yourself, you’re at the right place. First thing first, let’s find the reasons why we are about to use the camcorder as a webcam. First of all, camcorders are a handheld device that can be moved around to capture moving objects. Where webcams are just stable mini cameras to shoot users in front of a computer. 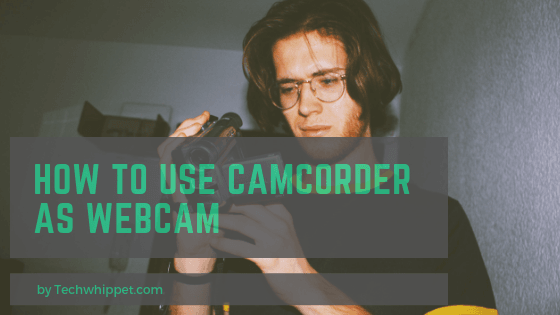 When it comes to online video chat, a camcorder isn’t enough as they don’t shoot constantly by default. If you don’t want to invest after a new webcam, we have a set of steps to turn the camcorder into a webcam. What Will You Need for The Process? A Firewire or Analog camcorder. A firewire card(in case you have a Firewire camcorder). A TV tuner(for analog camcorders). A Tracker software like ‘Eagletron TrackerCam’. You might have a place to put the webcam that we’re about to prepare. First of all, place the camcorder on that spot. You can use a tripod to install it with stability. Once placed, plug in the camera into the video card of the CPU. In case of analog cams, plug it into the TV tuner card. Keep in mind to install the camcorder within the reach of the cables that will come out of your computer. As we’re going to use software to use a camcorder as a webcam, we have to install it at this point. As we’ve mentioned earlier, if you use a recommended software like TrackerCam, it will be easy to use and install. Plus, it can detect the video card with no hassle. We’re almost done with the process. You can check the webcam with software like windows messenger or skype. In apps like Tracker Cam, there are some extensions and add-ons to enjoy with. Some of them will let you control the webcam remotely as well. Also, it can track moving objects and can be used as a security camera. However, if you don’t have a video editing card in your computer, you may need to put some extra efforts. But almost every modern computer comes up with this feature.